Ari and Bep were brother and sister. Ari was born 21 December 1940, his sister Bep 30 March 1907. Both were born in Meppel. They were the children of Maurits and Jeannette Cohen. Maurits died in 1930, his wife in 1933.
not survive the War either. In the twenties Ari Cohen had a Drapery called Cohen’s Drapery. He traded in men’s clothing materials, corduroy, lining and haberdashery.The first wholesale business was at 1Oosteinde , later on he moved to 1 Catharinastraat In 1927 his father Maurits Cohen became a partner, but only for a short while, as his father died in 1930. 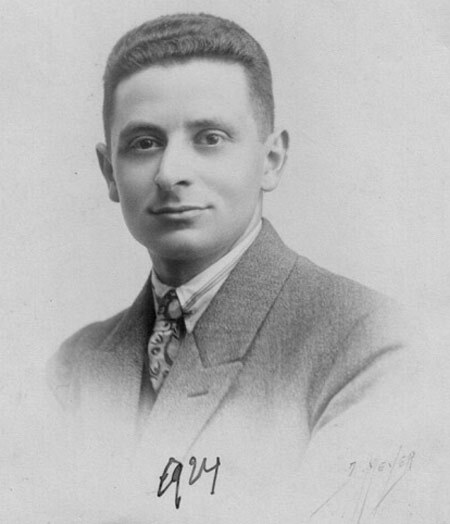 Did Ari have other interests, was he unsuitable for the trade or did the economic depression play a part? We will never know, but he gave up his business 1 November 1935. Ari began on a new carreer. Bep Cohen was the widow of Mauritz van Esso, owner of the Meppel Gold & Silver Business Inc. and watchmaker’s. From the end of the 19th century the firm had its premises on Hoofdstraat. 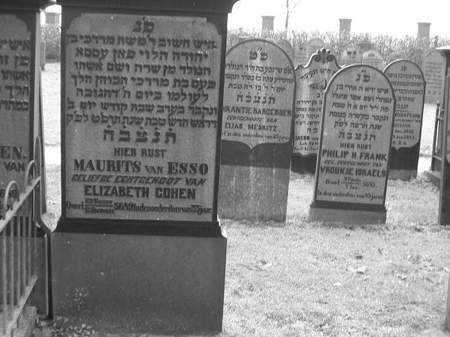 Maurits Van Esso, the husband of Elizabeth, died at a young age and was buried at the Jewish Cemetery on Steenwijkerstraatweg. 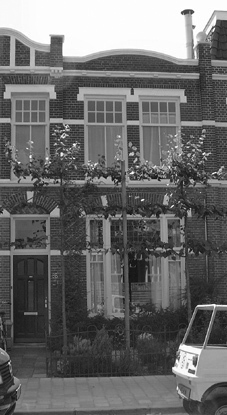 Brother and sister Cohen went to live together at 86 Emmastraat. They were very musical people. Ari was a fine bass singer and Bep played the piano beautifully. Both made a great contribution to musical life in Meppel.They had singing lessons from Marthe van Werven, who came especially from Amsterdam. Bep had a Steinway grand piano, which was played on daily. Their piano tuner Lingeman said in 1942, when he came to tune the grand piano, it was better for them to exchange the grand piano for a simple piano as this piano would be one of the first things the Germans would steal. Bep, who was not very fond of Christians then said: 'I would rather the Germans had it than the christian dogs.' In October 1942 the grand piano was of course the first thing to be taken out of the house. Van Gend and Loos transported it to the gym of the Rijks HBS (state secondary school) on Zuideinde. There is nothing left of the piano; the last winter of the war it was burned in the stove. 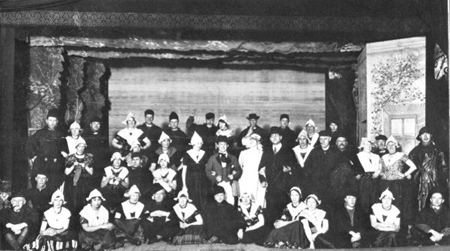 left (the man with the bowler hat) is Ari Cohen. Ari was cantor and pastor in the synagogue, and also he was a teacher at the (former) Jewish school in Touwstraat. The combination of pastor and teacher meant a great step back, compared to the beginning of the twentieth century. Attendance both at the synagogue and the school had declined considerably. Ari, the successor of H. Cohen van Delft, who had been pastor of the Nederlandsch Israelitische parish for a while. Until 1937 it was Siegmund Leuvenberg who lived at 76 Emmastraat. His children were born in Meppel; Clara (1932) and Gretha (1933). Leuvenberg left Meppel and moved with his family to Apeldoorn, where he went to work in the jewish Mentally Insane Institute Apeldoornsche Bosch. Without any doubt he must have worked in close cooperation with the brother of Maurits Lobstein, Jaques, who was the director of this Institute. On the occasion of his departure from Meppel, a farewell ceremony was held for Leuvenberg in the synagogue and Cohen van Delft was inaugurated. The first was honoured with the title ‘Chawer’ then. What was so remarkable was the presence of the representatives of the Nederlandse Zionistische Bond and the Zionistische Jeugdvereniging at the ceremony. The Germans murdered Sigmund, his wife Rosa and daughters on 23 July 1943 at Sobibor. Every spring, Ari would practise on the Sofar (rams-horn) for the Day of Reconciliation. It was a plaintive sound; the neighbours hated it, it sounded like creaking doors. Once a neighbour rang and said ' you have to oil yours doors, the noise is driving me mad.' Ari explained the situation, and the neighbours learned to live with it. Of course the Cohen family also built a Tabernacle (tent) in the garden, which had a small pipe coming out of the roof in order to see the stars. Ari and Bep were rather stocky people, who enjoyed their food and sweets. On the Sabbath the girls next door would put the lights on. The table was set beautifully with silver cutlery, candlesticks and dishes with many treats. Diny Luchies, one of the girls, still has a painting in her possession that she received from Bep for her help on the Sabbath. Their house had no alley, but they had permission to use the alley of the Luchies family for picking up the coal and bringing the rubbish to the street. Bep would make her maid bring the dustbin behind the house of the Luchies, and then Bep would say to Mrs Luchies: As Christians are to work for Jews and as the maid is so thin, 'you will put the dustbin on the road, won’t you?' Every week would be the same ritual, and every week Mrs Luchies would say the same thing: 'I will do anything for you, but not that.' This would go on until the Cohen’s were deported. When times were good, every afternoon Bep would go to the hairdresser’s. Dijkstra would come with his taxi to pick her up. Daughter Diny Luchies: I sat opposite the mirror and saw the taxi almost capsize as Bep stepped into it. Troost, builder and estate agent emptied the house of Ari and Bep in three phases. This was done according to the Tweede Liro Verordening issued on 21 May 1942. Herein was stated that Jews must surrender all works of art and other collections to the Liro Bank. All valuables were put in the handcart and taken away. It was known that the clearance personnel would steal many valuables. Some of the most expensive things would disappear to a farmer in Tweeloo. In the evenings first the gold and the silver was taken via the back door of the neighbours, to elsewhere. The following phase was the antique Chinese vases, and finally the valuable Delft blue porcelain was taken out of the house. All Bep’s beautiful jewellery, which was taken away with the handcart, has never been returned. However, after the war some of their possessions were found back. Ari was an avid book collector and the story goes that the Cohen house was full of books. During the war all the books had disappeared. After the war, as a miracle these books started to appear again. Spiritual books with a value of fl. 300,- and novels at a value of fl. 200,-.These books were given to Mrs S. H. Cohen, Tuinbouwstraat 13a, Groningen, one of the heirs of Ari. Just as striking were the shares and bonds of Elizabeth that had survived the war. She possessed a lot more than her brother. They were shares in Republic Steel, Gotham Hosery Comp, Studebaker Corp and the bonds Amsterdam 1933 and Haarlem 1938, which were found in a closed envelope in the house on Emmastraat, surviving the war. The value of these was about fl. 5.000,-. 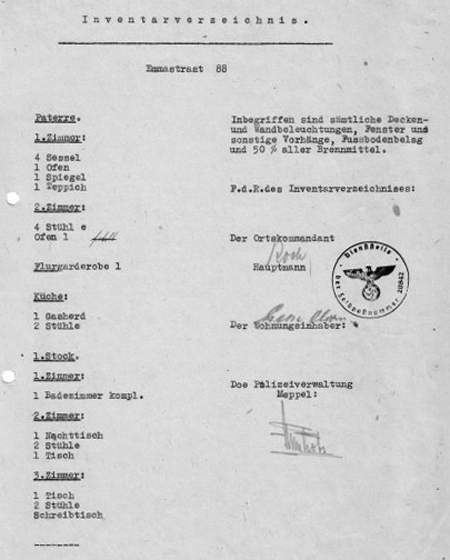 On 17 August 1942, Ari Cohen was taken to a camp at Linde. Bep was desperate; she did not know what to do anymore. Father Luchies would often sit by her bed at night to calm her down. One day in August, the Germans made Bep dig up potatoes at Lankhorst. This chic lady of course had no suitable shoes or clothes for this kind of work. Neighbours gave her clogs (wooden shoes) (size 45) a skirt, blouse and a cardigan. She dug potatoes for precisely one day and then the neighbour, Mr Luchies went to doctor Dhont who was family doctor to Bep and the Luchies and respected by them, to tell him that this could not go on. Dhont stated that she could not dig up potatoes anymore. In the last week of September she went to live with the Van Kleefs on Ceintuurbaan, where she could only stay for a short while. The Germans confiscated the house belonging to her and her brother; she had to evacuate the building before 1st October. Of course everything had to be left in tact, so the inventory was made by among other people Dutch policemen. Mr and Mrs Luchies cried tremendously when they had to say goodbye to Bep; it made a great impression on their daughter Diny, because she had never seen her father cry before. Ari and Bep never saw each other again. When Bep arrived at Westerbork on October 3rd, Ari had already been transported to Auschwitz and killed. He had left Westerbork on 24 August and was gassed on the 30th of September in Auschwitz. Bep was deported 5 October to Auschwitz and was killed on 8th October.